John 5's sixth solo effort showcases his diversity and depth. John 5 may be best known for his tenures as guitarists for David Lee Roth, Marilyn Manson and currently Rob Zombie, but he’s also quite the prolific solo artist. In fact, God Told Me To is the Michigan-born musician’s sixth solo release. The record proves John 5 as a diverse, slick player with a strong emotional centre. He plays in service of the song and isn’t overly showy, which is a refreshing change for many noodling, flamboyant rock-oriented players. He is also an impressive songwriter, having penned music for soundtracks as well as his releases. The “trouble” with the record is that it may be a little too varied for fans who have come to know Mr. 5 from his work with Manson and Zombie. There are some industrial and metal pieces here, don’t get me wrong, but where the guitarist really shines is when he digs in deep and pulls out some bluegrass, blues and desert-kissed guitar. There are many moments of haunting beauty to be found between the hedges of industrial metal and I certainly hope this record is given a fair shake by listeners. In talking about God Told Me To with various press outlets, John 5 expressed considerable excitement over getting to “go acoustic.” For a career largely built on electric shredding and industrial strength pounding, gearing down is an interesting concept for a man who wears a mask. The album cover, designed by Zombie, builds the acoustic surprise further. God Told Me To opens with a predictable piece of work in “Welcome to Violence.” It sounds like what fans would expect out of a Manson-era John 5, punched up with effects and production tricks. A cover of Michael Jackson’s “Beat It” follows. The single was originally released on what would have been Jackson’s 53rd birthday in August of 2011. It’s a pretty straightforward number that finds John 5 playing the melody without adjusting much. The interchange between various the various guitars at work is a nice touch, but this is far from the best track on the album. The solo is a nicely measured homage to Eddie Van Halen’s original, though. The acoustic numbers kick in with “Asland Bump,” a tidy little bluegrass-tinged piece. It sounds like something that would fit perfectly in the grime of HBO’s television series Deadwood, complete with handclaps and layered strings. Other acoustic pieces, like the brilliantly-built “The Castle” and the Spanish-kissed “Noche Acosador,” are far more revelatory to the depths of John 5’s talents than the predictable industrial tracks. Even in those louder moments, like the shredding “The Lust Killer” and the insistent “Killa Fornia,” his sense of melody shines. Overall, God Told Me To is a very satisfying instrumental record. 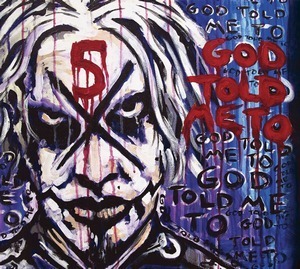 It’s an exhibition of John 5’s skills and mastery over the art of song, not just the art of guitar. He is a player of complexity and conscience, presenting whole visions for each piece on the record.